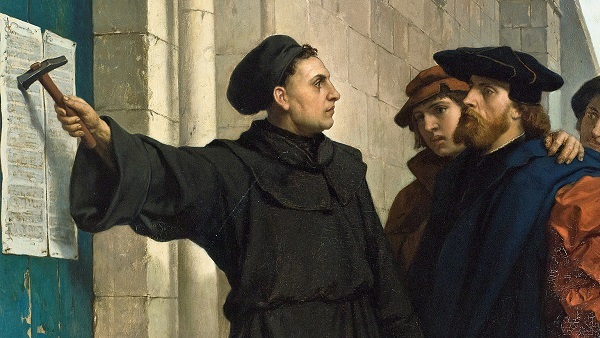 Martin Luther presenting the 95 Theses, painted by Ferdinand Pauwels in 1872. What was the difference? Communist Revolution changed systems (political and economic) to change man. The Protestant Reformation relied upon God’s grace to change human heart and spirit. That inner change went on to transform intellectual, religious, social, economic and political systems. Russian revolutionaries such as Lenin relied on a humanist ideology. The protestant reformers relied upon God’s promise through prophet Ezekiel, more than 500 years before Christ. Although he was born in Jerusalem’s priestly family in 622 AD, Ezekiel grew up as a “captive” in modern day Iraq. His people, the Jews, forcibly exiled from their homeland, knew God as someone who hated Jews, their religion and their temple. God sent the Babylonians to destroy Jerusalem and its temple, kill sinful men, women, and children, or take them as war booty to Iraq. This was neither the first nor the last time God had revealed Himself as a consuming fire, a holy Judge of sinful humanity. Destroying a nation is easy — communism did that. Is God able to reform and rebuild nations? Was the Supreme Judge also merciful and compassionate, a Savior to sinners? Ezekiel’s optimistic vision for the resurrection of his nation is narrated in Chapter 37. He sees his nation as a valley, filled with daed and totally dried up bones. None of his co-religionists believed that a nation so completely destroyed could be rebuilt. Even the prophet was unsure. Yet, God commands him to prophesy to the dead bones. Behold the marvel . . . scattered bones came together in his vision. . . life and spirit returned . . . and an army of rebuilders was raised up. Skeptical Jews accepted Ezekiel as God’s prophet because his incredible words came true within their life-time. Actually, God’s promise to resurrect Ezekiel’s dead nation began in chapter 36. God Himself assured the skeptics that he would clean sinners of their moral filth. He would give them a new heart and a new spirit . . . that is called “conversion.” Jesus and Martin Luther described spiritual-moral conversion as being “Born Again” spiritually. Social Media is not accurate. Sixteenth Century Protestant Reformation did not begin with Luther’s nailing of the 95 Theses. Many had protested against the corruption of medieval church. German and global reformation began with the reform of Luther’s own sinful heart. His protest against Christianity’s corruption was simply an external manifested of the truth that had changed his inner life. For years Luther had so agonized about sin’s power over his heart, that he suffered from clinical depression. He had done everything that the Church taught him about religion: from pilgrimage to relics, from praying to the saints to fasting, from rituals to the Sacrament of Penance — following the idea that God forgives penitent sinners. Luther confessed every sin that he could remember. He would spend as many as six hours at a time, confessing the sins he had committed in his thoughts, his words, and his deeds. These included his pride, his impatience, irritated words that hurt others. Yet, as he soon as he got out of his confession session, he would remember yet another sin that he had forgotten to confess. He would return to confess and his priests would get tired of Luther’s inner, moral scruples. Johann von Staupitz, the head of the Augustinian Order where Luther was the monk and professor, was also a mystic. He tried hard to teach Luther the secret of merging his finite spirit into the Infinite Spirit (God) as a drop merges into ocean. Luther tried but It did not make sense to him. He knew that his soul was sinful, but God was holy. Wouldn’t his sinful soul contaminate the pure ocean that is God? Luther tried hard but he could not love a God who was so just that He had to punish sins that the sinner himself had forgotten. Luther often confessed that He had begun to hate God who punishes sin. Luther’s moral conscience frustrated Staupitz. It also impressed him. He respected Luther’s scholarship and unusual capacity for hard work. Having failed in meeting Luther’s deep spiritual need, Staupitz decided to give up being the Chair of the Bible and asked Luther to take up that Chair. Luther gave 15 reasons why he could not teach the Bible, yet submitted to authority. In 1513, he started studying and teaching the Bible. Luther was Born Again not in an evangelistic meeting or on his knees in prayer, but in his university’s Study Tower, diligently studying God’s word, especially Psalms, Romans and Galatians. Psalm 22, for example, led him to appreciate sinless Christ who became sin for us and experienced alienation from God just as Luther had been experiencing. God’s holy son cried out to his Father, “Why has thou forsaken me?” He studied Paul’s epistle to Romans through the eyes of a Christian Humanist, Erasmus. That opened Luther’s eyes. It transformed his worldview and gave him a new heart, at peace with God. God, Apostle Paul said to Romans, was not merely a just judge who punishes sin. In his mercy, God also justifies sinners, without violating His absolute justice. That is why the Lord Jesus became the sacrificial lamb of God and took our sin upon the cross. His sacrifice satisfied God’s justice. Therefore, Christ’s blood, shed on Calvary’s cross, became Ezekiel 36’s “water” that cleans us from our iniquities. It becomes the judicial basis for reconciling repentant and believing sinners with Holy God. The resurrected and ascended Christ sends His Spirit to revive our spirits, dead in trespasses and sins.